Neo-classical screen at London Terminus at Euston Grove, from Bourne (1839) Drawings of the London and Birmingham Railway (London: Ackermann and Co.). 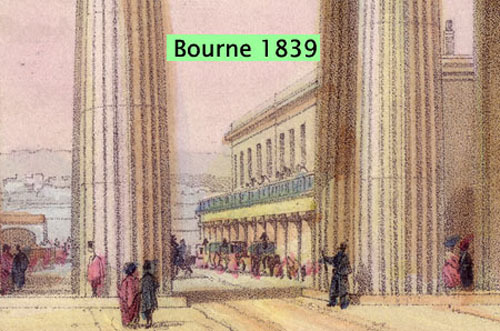 John Cooke Bourne’s lithograph of Euston Arch and the neo-classical screen in from of the Euston Grove terminus for the railway was published among his Drawings of the London and Birmingham Railway (1839) (British Library collection). This item also was sold as hand-coloured prints and much copied. East-leaning section of neo-classical screen. London Terminus at Euston Grove, from John C. Bourne (1839) Drawings of the London and Birmingham Railway (London: Ackermann and Co.). Close-up of station. London Terminus at Euston Grove, from John C. Bourne (1839) Drawings of the London and Birmingham Railway (London: Ackermann and Co.).